Yesterday my wife and I found ourselves heading for a great nature reserve on the outskirts of Pretoria in South Africa. The reserves name is Rietvlei Nature Reserve and we return there when we find ourselves in this part of South Africa. Bird life is quite prolific and in a mornings outing we manage 61 species including Little Egret, Northern Black Korhaan, White-throated Swallow, Yellow-billed Duck, Malachite & Pied Kingfishers, Ostrich, Red-collared Widowbird and many many more. On approaching Ottterbrug (Otter Bridge) at the reserve, where infact we did actually see an awesome sight of two beautiful African Clawless Otters (Aonyx capensis) swimming and fishing together in the dam, then get out, cross the small road between the dam and its tributary stream, climbed back in to fish then they disappeared together as quickly as we saw them. We parked the car next to the small dam and started to scour the dam with our binoculars, immediately my eyes fell upon a small white Heron known as a ‘Little Egret’ patiently and as still as a ‘statue’ waiting for the slightest of movement in the water. The Little Egrets are small in comparison to its larger cousin the Great Egret at only 65 cm (2ft 1in) long with a wingspan of just 105 cm (3ft 2in). A snowy white plumage, black legs an distinctive bright ‘yellow’ feet make this Egret easily recognisable. 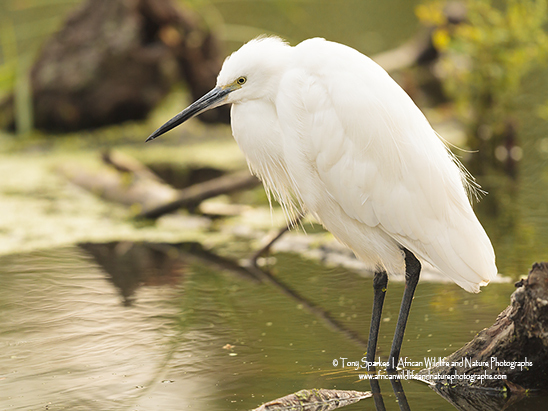 Little Egrets eat fish, insects, amphibians,and small reptiles and as observed this morning they stalk their prey in shallow water, often running with raised wings or shuffling their feet to disturb small fish but as witnessed they also stand still and wait to ambush prey.